On the phone now !!!!!!!! Song No 14 Audience singing with Paul & Sam? NOT TO BE MISSED !!!!!!!! Mick Ralphs, and Simon Kirke for the one off Bad Company show in Hollywood, Florida on August 8. Get the chance to see this tour from the planning stages to the performances. Keep on Rockin' me baby !!!! Best FREE Album period !!! We're opening the festival on the Thursday at 5.30 pm - tickets are only a tenner! The 2008 Cambridge Rock Festival is here! Led Zep Too, The Pure Floyd Show, Split Whiskers, Lost Weekend, Free Will & The Bad Influences. The Blockheads, Eddie and The Hotrods, The Sweeney, Redsoxx, Nigel Graham Blues Readction, Blanco Diablo. Alt Stage: Acer, After Effect, Little Alien, David Vaughan, Tinlin, Timefall, No Plan B, Bridgefire. Mick Ralphs' Bad Company, Juicy Lucy, Deborah Bonham, Martin Turner's Wishbone ash, Tracie hunter Band, Rattlesnake Remedy, GetVegas, Medicine Hat, Ramshackle Daddies, Morph, Caimbo. Alt Stage: Spit Like This, The Winter Kings, Trailer Trash Orchestra, Return of the Furies, Little Chuck Little, The Get-Up Forward, The Whybirds, Red Track, Neil Cowlan, Fingersmith, Voodoo Hussy, Caleb, Sand Dollars, Vender, Ascendia, Satellite to Nowhere. Marillion, Andy Fairweather Low, Mostly Autumn, Jim & Geoff (Caravan), The Reasoning, John Otway, Breathing Space, Touchstone, Bijoumiyo, Taildragger. Alt Stage: Bloom, Joanovarc, Keltrix, 9FoldPunch, Jynxt, Delphi, Katie Parker & The Elements, Bokaata, The Shills, The Jelly Royale, East India Company, Isaacs Aircraft, My Little Red Door, We Found The Fox, Trash Munroe, Article 48. Listen to the pace of the song, very unusual but very 70s too. 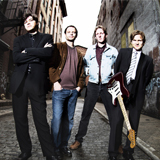 Stone Mask is a 2008 studio project from Quakertown, PA, consisting of music and lyrics primarily written by Steve Gojeski, with musical collaboration on 3 songs with Mike Perkin, Dave Perkin, Rich Greener and Pat Dubois. Early 70s rock with a blues foundation, reminiscent of Led Zeppelin, Free, and Pink Floyd. Groove oriented songs, heavy on vibe, lyrics, and guitar solos. The cover art is by Laura Gojeski. Swagger is composed of four young people from Atlanta, Georgia, who share a love of playing music and songwriting. They bring energy and enthusiasm to their playing of traditional and modern blues, rock standards and original songs. the youngest band to have ever done so. Show your support - Visit the band's Websites !!! US interview with UK rockers Get Vegas. Get Vegas" recalls the classic rock sounds of Bad Company and Thin Lizzy but with a new style all their own. "Get Vegas" is living proof that a young band fresh on the music scene can embody arena rock classic appeal. "Get Vegas" is the band to watch for in 2008. Call in number is: (646)716-7169. Don't miss the opportunity to see one of the greatest rock bands ever perform together again for one night only! BAD COMPANY TO REUNITE - ONE NIGHT ONLY! Tickets on Sale Saturday, July 5 at 1 p.m.
HARD ROCK LIVE IN <?xml:namespace prefix = st1 ns = "urn:schemas-microsoft-com:office:smarttags" />HOLLYWOOD, FL AUGUST 8th! 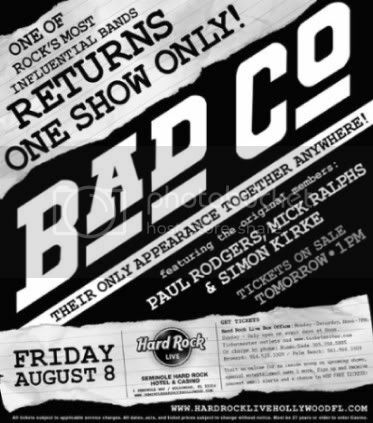 Los Angeles, CA  July 2, 2008  Bad Company original members Paul Rodgers, Mick Ralphs and Simon Kirke will reunite for the first time in nearly a decade. Following a huge demand from fans, Bad Company will perform one show only at Hard Rock Live at the Seminole Hard Rock Hotel & Casino in Hollywood, Florida on Friday, August 8th. Tickets will go on sale Saturday, July 5th. Bad Companys hits such as Cant Get Enough, Feel Like Makin Love, Rock Steady, Movin On, Shooting Star, Rock & Roll Fantasy and Bad Company (the first to self title their band name in a song and album) propelled them to the forefront of the 70s arena rock movement. Paul Rodgers, Mick Ralphs and Simon Kirke will reunite to perform together for the first time since 1999 (founding member Boz Burrell passed away in 2006). Rodgers, celebrating his 40th year as a recording artist, recently performed at Londons Hyde Park with Queen as part of the The 46664 Concert  Honoring Nelson Mandelas 90th Birthday and will be embarking on a world concert tour in support of their new studio album September. His most recent solo CD/DVD release, Live in Glasgow, charted internationally at #1 and #3 and is certified Gold. 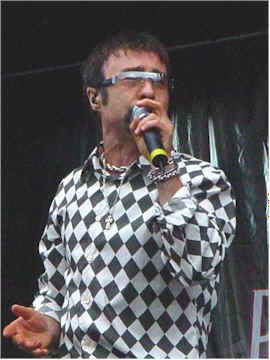 After the break up of FREE (best known internationally for their smash hit All Right Now co-written by Rodgers) vocalist and multi-instrumentalist vocalist Paul Rodgers connected with ex-Mott the Hoople guitarist Mick Ralphs, FREE drummer Simon Kirke would later join that year and the trio began rehearsing. Ex-King Crimson bassist Boz Burrell came aboard a few months later and the supergroup Bad Company was solidified. Before releasing their first album, the band had toured for months and in 1974 signed to Song Records (owned by Led Zeppelin and distributed via Atlantic Records) to release their highly anticipated debut album, titled Bad Co. Propelled by the hit single Cant Get Enough, the album would quickly hit #1 on the charts and remain in the Top 40 for four straight months. To this day, the multi-platinum Bad Co. album arguably remains one of the most accomplished debuts in rock history, reading as a virtual greatest hits set in itself. Straight Shooter, Run with the Pack, Burnin Sky and Desolation Angels would all follow within a five year run throughout the 70s yielding more multi-platinum awards with hit after hit, Feel Like Makin Love, Seagull, Run with the Pack, Burnin Sky, Rock N Roll Fantasy, making Bad Company one of the biggest concert attractions of the decade. In 1982, the band released their final recording Rough Diamonds and the single Electricland would be their last before disbanding. The groups multi-platinum award-winning greatest hits set 10 from 6 has become a record collection staple. 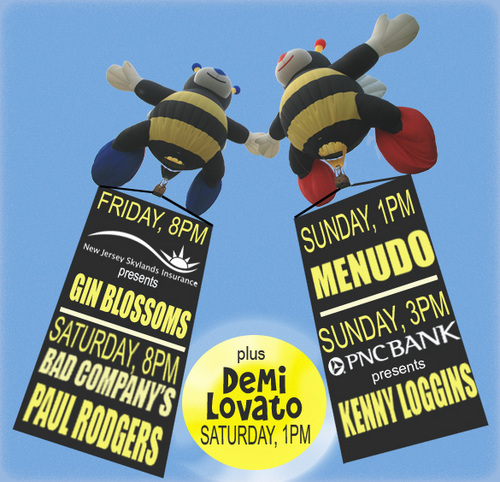 Tickets cost $100, $75, $50* All seats are reserved and available at the Hard Rock Live Box Office, open Monday  Saturday from noon to 7pm and on Sunday  only open on event days at noon. Tickets also are available at all Ticketmaster outlets online at www.ticketmaster.com or charge by phone: Miami-Dade (305) 358-5885, Broward (954) 523-3309, and Palm Beach (561) 966-3309. Doors open one-hour prior to show start time. *Additional fees may apply. Just before the former frontman of the Bands Free, Bad Company and The Firm took the stage at a benefit for the "Kids Rock Free" Program at the Fender Museum in Corona CA, David Wohl of KPSP CBS 2 TV in Palm Springs talked to him about his band . Makana performs in multiple configurations, including solo, duo & with a band. The support instruments may include drum & bass, keys, sequencing, strings, and harmony vocals. and a myriad of other sound making implements. He is a seasoned and very powerful presence onstage, both as a solo performer and in the context of other musicians. 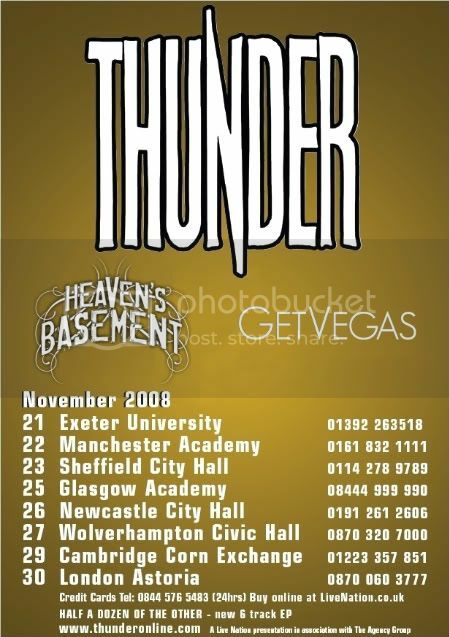 Get Vegas open for Thunder Tour - Awesome news guys!!!! The former Whitesnake rocker was 59. Former Whitesnake star Mel Galley has lost his battle with cancer. The 59-year-old guitarist revealed he was seriously ill in February 2008, telling fans he didn't have long to live. In a candid post on his MySpace.com page, he wrote, "I've had a fantastic life. I have been very lucky. I have seen some great bands, and played with many great musicians. "I have enjoyed some tremendous experiences. I am thankful that I can say a proper goodbye to all the friends I have made, who are now rallying round me." The star, who also performed with classic rock acts Trapeze and Phenomena, revealed his final weeks were full of fun of fun and laughter. In a recent post, he wrote, "Friends visit me each day, I have drugs in me 24/7, and I have a plentiful supply of gin and tonic by my bedside. I even have my own ice machine! In fact, it's just like my Whitesnake days." Born in Staffordshire, England, Galley was forced to quit Whitesnake after injuring his arm in a fairground accident in Germany. He suffered nerve damage and pioneered a spring and wire device, known as The Claw, that was fitted to his hand to enable him to play the guitar. During Whitesnake's recent European tour, frontman David Coverdale dedicated "Love Ain't No Stranger" to his sick pal. Galley wrote the song with the singer. Trapeze frontman Glenn Hughes has paid tribute to his childhood friend, stating, "I'll see you in the Garden one day, and truly recognize you as my brother." Experience Hendrix presents unforgettable highlights from two star-studded tribute concerts on behalf of Jimi Hendrix, hailed by critics and fans alike as the greatest guitarist of all time. Filmed in San Diego and at the Paramount Theater in Hendrix's hometown of Seattle, these special, never-before-released performances feature legendary blues giants Buddy Guy and Hubert Sumlin coming together with Paul Rodgers, former Rolling Stones lead guitarist Mick Taylor and the newest generation of guitar heroes including Kenny Wayne Shepherd, Robert Randolph, Pearl Jam's Mike McCready, Kid Rock's Kenny Olson, and Vernon Reid to celebrate Jimi's legacy. Joining forces with these great artists are Mitch Mitchell and Billy Cox from the Jimi Hendrix Experience, as well as Chris Layton and Tommy Shannon from Double Trouble, the powerful rhythm section who served the late Stevie Ray Vaughan. 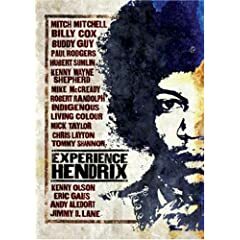 Loyal contemporaries and ardent acolytes pay homage to one of the greatest guitar heroes of all time on EXPERIENCE HENDRIX, a collection of highlights from two Jimi Hendrix tribute concerts. Filmed in San Diego and Seattle (Hendrix's hometown), the shows feature legendary blues artists Buddy Guy and Herbert Sumlin alongside Rolling Stones guitarist Mick Taylor, Kenny Wayne Shepherd, and Pearl Jam's Mike McCready, each covering one of Hendrix's many powerful hits. "Best New US Rock Band for 2008"
The Muggs have been nominated this year for the 2008 Detroit Music Awards! NEW YORK, NY, June 2, 2008- VH1 is joining in the global birthday celebration of one the worlds greatest leaders, Nelson Mandela. The music and pop culture network is the exclusive U.S. outlet televising The 46664 Concert Honouring Nelson Mandela at 90 taking place in Londons Hyde Park on Friday, June 27. The concert will also be streamed live on VH1.com that day. Artists already committed to perform include Amy Winehouse, Leona Lewis, Queen + Paul Rodgers, Annie Lennox, The Sugababes, Simple Minds, Dame Shirley Bassey, Andrea and Sharon Corr, Jerry Dammers and Razorlight will take the stage to honor Nelson Mandela. Many other world-renowned artists and performers will also be performing. Hosted by multi-talented actor/rapper Will Smith, VH1s coverage of The 46664 Concert will stream live on VH1.com (at VH1.com) on Friday, June 27 at 1 PM EST. A 2-hour special of concert highlights will premiere on VH1 on Monday, June 30th at 9 p.m. EST/PST. The event will also be simulcast on VH1 Classic, VH1 Soul and MHD, MTV Networks music high-definition channel. In addition to being a monumental birthday celebration, the event also serves as a response to the global HIV/AIDS epidemic designed to invite the whole world to take a stance on this worldwide health issue. The concert name refers to Nelson Mandelas prison number (46664 - pronounced four, double six, six, four) when he spent 18 years of his 27 years in prison on Robben Island off the coast of Cape Town in South Africa. Oprah Winfrey, former President Bill Clinton, Prime Minister Gordon Brown, Robert De Niro, Forest Whitaker are among those who will attend some of the events surrounding the three-day celebration in London which culminates in the evening concert. South African and African artists Johnny Clegg, Sipho Mabuse, Loyiso, the Soweto Gospel Choir, Papa Wemba, Sudanese war child rapper Emmanuel Jal, and AIDS orphan choir: The Children of Agape will also join in the celebration. The concert proceeds will benefit Nelson Mandelas HIV/AIDS charity 46664 that he founded in 2002. I am supposed to be retired but my friends and the charitable organizations that bear my name want to use my 90th birthday year to raise funds to continue our work and so of course I want to help them, said Nelson Mandela. Mausoleum Records, Europe's number 1 heavy metal label, has just released KING KARMA's debut to European stores and Amazon UK. Mausoleum has given the debut a new cover under the name "Mama's Pride" which includes the initial 12 tracks plus 2 bonus tracks, "Lady White and "Born in '69". Look for it this summer! How much talent can you get in just one gene pool? Looking at the Bonham family tree, loads. 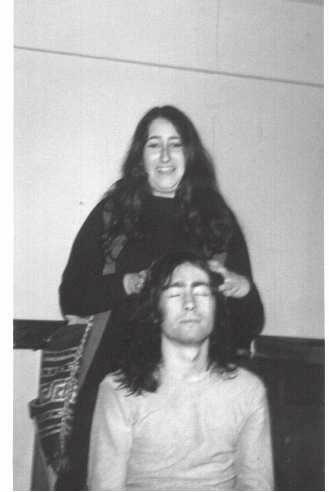 Tonight Deborah Bonham - sister of John, aunt of Jason - joins us for the first time. Music is in her blood, and her vocal style draws comparisons with Janis Joplin and Fleetwood Mac's Stevie Nicks. However, Deborah cites Stone The Crows' Maggie Bell as her key influence and there the similarity is greatest, in a performance that runs the gamut from blues to soul to hard rock to English folk, and all the way back again. Also on the night, Jim our chef will be barbequing on the veranda  not hidden away in the kitchen where he usually is! Pick up a burger and a beer for just £5 before the show, a perfect after work wind down to set you up for the weekend. Youd be hard pressed to find a full nights entertainment for less than £20 anywhere else in the city! 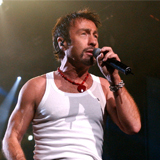 "Everyone knows that Paul Rodgers is one of the greatest singers in the world. What they are only just waking up to is that there may never be another like him." - Mick Wall Classic Rock Magazine PAUL RODGERS' passion is writing and performing music. He continues to record and tour Internationally, although this year on a limited basis. For a man who prefers to keep a low profile he has left his indelible mark on music... Platinum selling Singer, Songwriter & Self-taught Multi-instrumentalist. Written, Recorded, Produced and Released 28 albums since 1968. Sold over 90 million records. Formed and Led 3 bands to worldwide success: Free, Bad Company, & The Firm. Grammy Nominated Solo Career. Has Recorded/Performed with Jimmy Page, Jeff Beck, Brain May, David Gilmour, Buddy Guy, Joe Walsh, Slash, Nils Lofgren, Charlie Watts, Bryan Adams, Motown's Sam Moore & The Four Tops and others. IN 2008: "Live in Glasgow" DVD certified Gold in just 4 months. Charted Internationally #1 Canada #3 US and #4 in the UK. Paul Rodgers honored at the Fender Center for his 40th Anniversary as a Recording Artist. His exhibit was unveiled February 9th at the Fender Center's Museum along with Johnny Cash and Steve Miller. Rodgers headlined the first SuperJam Benefit Concert to raise funds for the Gridiron Greats Super Bowl Eve. Currently recording and writing with Queen to release the first Queen + Paul Rodgers album to be released in 2008 coinciding with a World Tour. *** MUST BE 21 TO ATTEND THIS EVENT *** ***ID REQUIRED *** EQC SHOWROOM LOCATED OFF I-5 @ EXIT 135/RIVER ROAD, TACOMA. PLEASE CONSIDER STAYING AT THE EQC HOTEL & CASINO IN FIFE. TWO MILES NORTH OFF I-5 AT EXIT 137. ENJOY EXPANDED PARKING, 1,500 OF THE NEWEST SLOT GAMES, KENO, AND OUR FULL-SERVICE PACIFIC RIM RESTAURANT. SHOW YOUR EQC TICKET STUB AND RECEIVE A ROOM RATE OF $77 PLUS TAX - A 37% SAVINGS. Singer/songwriter Paul Rodgers who blasted onto the music scene with his hit "All Right Now" celebrates his 40th year as a recording artist. 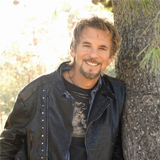 Rodgers was recently recognized by US Congress for his musical achievements and his philanthropist work with The Fender Center's "Kids Rock Free" Music Education Program in California. Through his efforts, Rodgers has helped raise over $200,000 for the program. The Proclamation was given by member of Congress Ken Calvet and presented to Rodgers, only the 8th person to receive such an honor, by Fender Center board member Jeff Bennett, Saturday, June 14th before a sold-out benefit concert in Corona to celebrate the 10th Anniversary of the center. "Music is the great connector, said Rodgers. It connects us to our emotions and to each other. Thanks to the U.S. Congress for recognizing the value of music." Currently, Rodgers is in the UK with Queen readying to perform at the celebration of Nelson Mandelas 90th birthday at Londons Hyde Park on June 27. Rodgers first met Mandela, performing at a South African 46664 concert in 2005 and is proud to continue to support the man and his organization, raising awareness about the impact of AIDS and promotes HIV prevention. "When you consider all of the indignities and injustices that have challenged Nelson Mandela, it's a miracle and a real testament to his fortitude and courage that he can still shine the light of peace. It's typical of the man's humility that on his birthday he should make this huge effort on behalf of other people. This will be one of the highlights of my life." In 1991, two of rock musics royalty highest ranking legends Paul Rodgers and Kenney Jones decided to join forces and create the powerful unit known as The Law. Although the union was short lived, the shelf life of the project has endured for years, equally with the amazing chapter in each of the two musicians career paths. Paul Rodgers journey began with Free in the late sixties, which netted him some incredible copyrights like All Right Now, Wishing Well and Fire and Water. After the untimely demise of their gifted guitarist Paul Kossoff, both Rodgers and drummer Simon Kirke teamed up with Mick Ralphs (Mott The Hoople) and the late Boz Burrell (King Crimson) and formulated the super group Bad Company. Aside from world tours and multi-platinum platters throughout the seventies like Bad Company, Straight Shooter and Running With The Pack, Paul left the band in good hands with a major hit Rock And Roll Fantasy at the turn of the decade, and then proceeded to craft his own solo path with his first successful solo album Cut Loose (Friday Music 1061) in 1983. Two years later, his good friend of the highest order Jimmy Page teamed up with <?xml:namespace prefix = st1 ns = "urn:schemas-microsoft-com:office:smarttags" />Rogers and formed the powerful unit The Firm. The band recorded two highly successful albums The Firm and Mean Business. Kenney Jones was a founding member of Englands The Small Faces. Along with the late Stevie Marriot, the late Ronnie Lane, and Ian McLagan , they formed an R & B/Psychedelic meets Northern Soul alternative to The Beatles and were blessed with many hit singles and albums to their credit. One of their most important achievements during the turbulent sixties was their Ogdens Nut Gone Flake album, with the amazing single Afterglow. Upon Steve leaving to form Humble Pie, Rod Stewart joined up along with Ronnie Wood and the new Faces were born. A few years later, after the tragic death of Keith Moon, and after a time of mourning, The Who enlisted good friend and superstar drummer Kenney Jones for several successful albums like Face Dances, Its Hard and Whos Last. Now, hold your breath, this combination of historical talent only takes us to 1991! The musical roots that each member of The Law brought to the recording studio table, would have made anyone at Atlantic Records proud, including the bands biggest fan and supporter Ahmet Ertegun, who signed the band soon after the two fellows had a chance meeting. and that is how the name THE LAW began the partnership which would garner them a hit album in the months to follow. ..one after another, all lent their artistic contributions to the project. Working as a national promotion manager for the Atlantic Records Corporation during the release of this album, the team was able to get The Law their sole #1 at AOR radio with the Rodgers penned Laying Down The Law. It was an exciting time as the album and the follow up singles achieved solid airplay for the better part of the year. Unfortunately, it was a very short-lived entity. Playing the album several years later, and during the remastering process, I didnt think anything but how strong the album really was. >From the kick off track For A Little Ride to the Four Tops sounding rock and roll balladry of Come Save Me ( Julianne) to the arena rocking Stone Cold, this album is chock full of great songs. In addition to the already finely crafted venture, we have located a very strong unreleased track Thats When You Fall In Love from the Atlantic vaults that just makes this album that much more enduring. Another Rodgers penned track, this rare gem truly shows where the band was headed musically and creatively. What a moment in time this was. Today, both Paul Rodgers and Kenney Jones are continuing their musical paths in various successful directions: Paul enjoys a solid solo career as well as being the lead vocalist with Queen + Paul Rodgers. Kenny joined forces with Rick Wills (The Small Faces/Foreigner) as The Jones Gang, releasing a new album in 2007. I personally would like to thank the guys for the years of great music, and it is a rocking validation for us here at Friday Music that we can make this fine album available once again for their legions of fans worldwide. The Law-The Deluxe Edition is a badge worth wearing. -Joe Reagoso, Friday Music, Inc.
P + C 2008 Atlantic Recording Corporation and Friday Music, Inc.